It may be still early May but Melbourne has slumped into its customary 7 months of what people from other places in our great land would declare winter. Are you satisfied with the performance of your ducted heating system in all rooms of your house? Are you being clobbered with excessive gas energy bills? 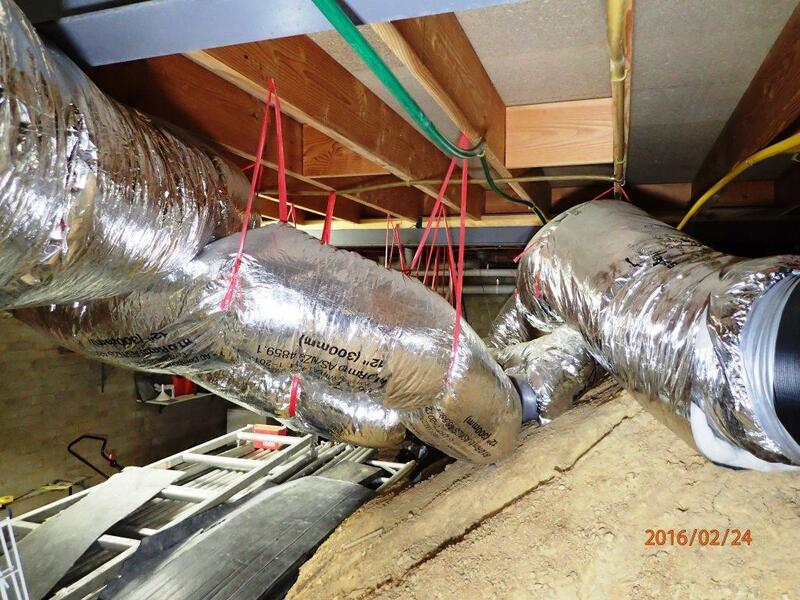 Have you ever looked into the roof space or sub-floor of your house to check what the quality of the ductwork installation looks like? 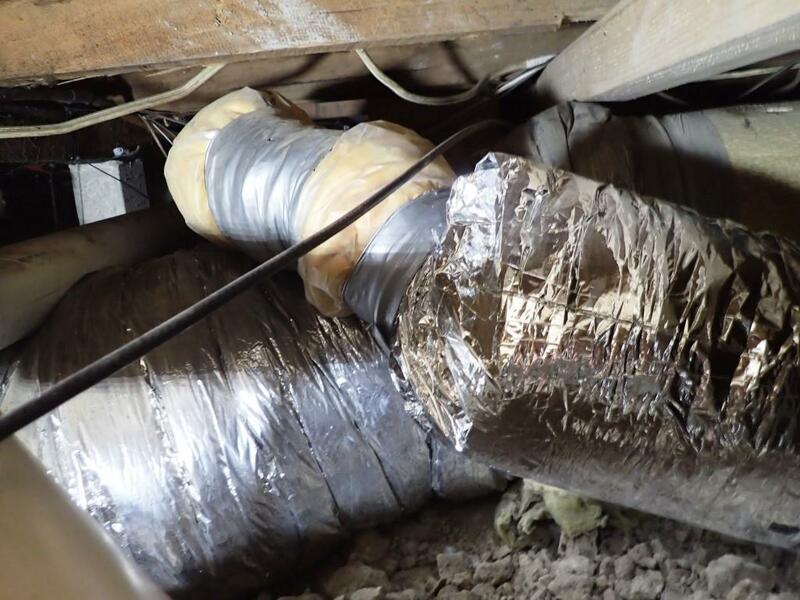 In our experience as forensic plumbing experts, we have reviewed literally hundreds of ducted heating installations and unfortunately many of these are defective if not woefully sub-standard or in some instances downright dangerous. The heating and cooling industry is one of feast or famine for those in the game. When the temperature goes high or low, consumers make quick decisions and they want what they need NOW. The industry works on this premise and it’s a cut-throat environment to make a dollar out of, especially for the installers (often sub-contractors) who are often working in cramped difficult conditions with time pressure bearing. The “get it in, get the money and get out” motto rules the day and call-backs are someone else’s problem for another day. However, as forensic plumbing experts we know the rules and Victoria is not the wild west – there are Australian Standards and Guides to Good Practice which must be adhered to. Far too often the strict regulations surrounding ducted heating equipment and ductwork design, specification and installation are disregarded, or not even understood. 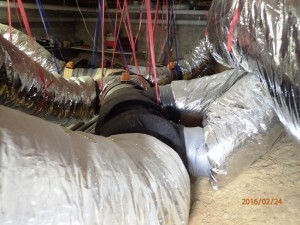 The most common faults relate to the poor installation method of the concealed flexible ductwork which can be squashed or tightly bent. This chokes the flow of air to the corresponding floor or ceiling outlet point. 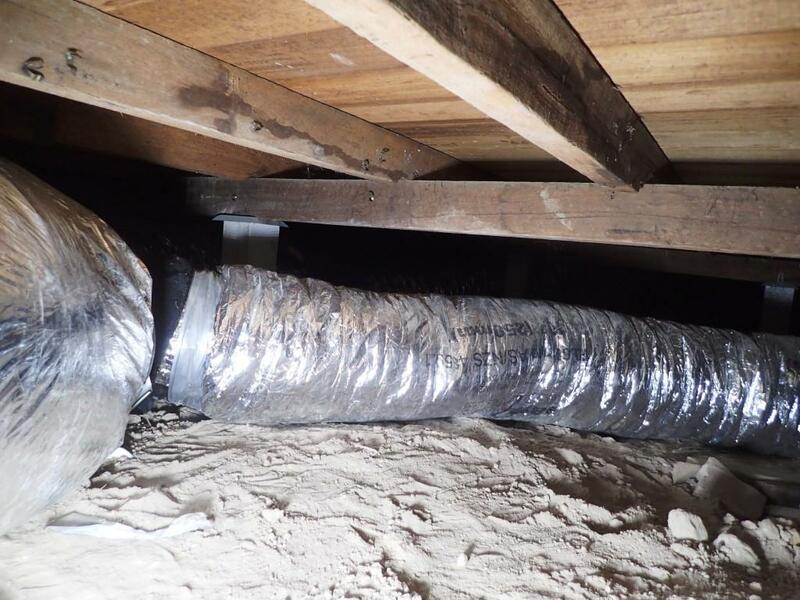 It is also noted that many of the installing tradespeople are not correctly hanging or supporting the ductwork either and often these jobs are carried out by apprentices or “trades assistants” who get the nasty jobs in confined spaces. 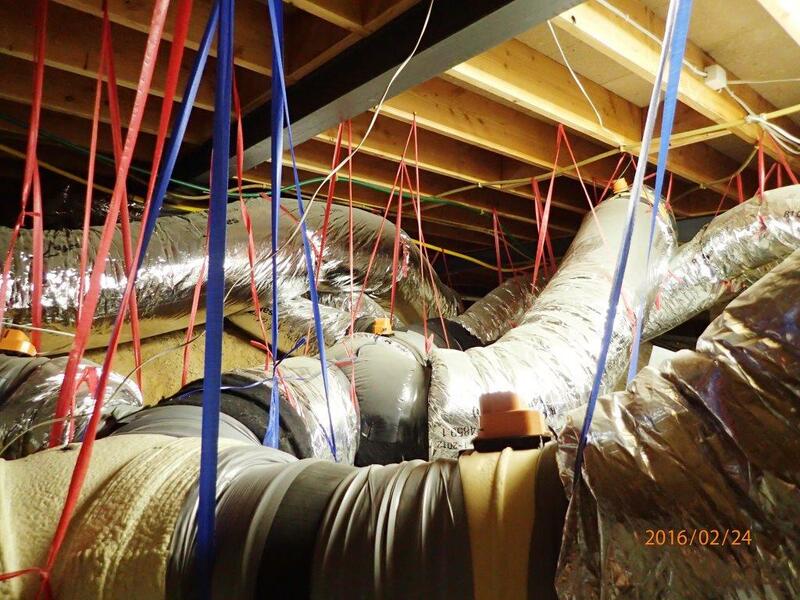 Many people will also not be aware that ductwork is required by the regulations to be suspended and supported at specified set intervals and that the support itself needs to include hanging tape and also a support bracket which stops the hanging tape itself from cutting into the ductwork. 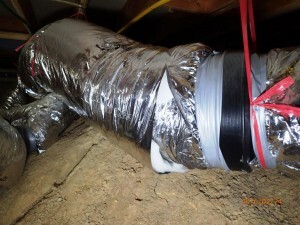 The reason that the regulations are so specific in regards to the hanging requirements of flexible ducting is because it is critical for good airflow (and therefore performance of the entire system) that the flexible ducting maintains its shape, but in the cut throat world of heating and airconditioning these things often get totally overlooked just to save the installer time and money, leaving you with the problems. So if your heating system isn’t working very well or is costing a lot to operate, it’s worth having a look in your ceiling space or floor space and if the ductwork installation resembles a dog’s breakfast and/or is not properly suspended and/or is not clearly labelled then we can guarantee that your heating system is not installed correctly and that is almost certainly costing you too much in gas consumption for not enough warmth in your house. All plumbing including gas ducted heating ductwork is covered by a comprehensive insurance scheme in Victoria and has been self-certified by the installing plumbers as being in compliance with Part 12A of the Building Act. If you believe that you have problems with your gas ducted heating system, call Metropolis Solutions and we can help you achieve plumbing compliance. Photo shows hanging tape but the ducts are just lying on the ground and not even suspended! The duct is also torn and damaged. A spiders web of duct hangers, none of it compliant and even more ducts just lying on the ground. How is a service person even supposed to access this? Hangers cutting into ducts due to no hanging brackets and restricting airflow plus more ducts just lying on the ground anyway. The plumber has also hung the ducts off the water and gas pipes above – another big no no. Another spiders web of non-compliance with faults everywhere. 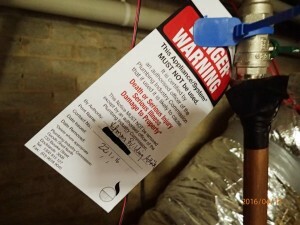 Victorian Building Authority DANGER tag fitted to one installation after being disconnected because it was dangerous. Another duct just lying on the ground. The plumber didn’t even try to use duct hanging tape. New duct (right) just roughly joined into the old yellow one without a reducer; totally non compliant. This installer was also supposed to replace all of the original yellow ducting but was too lazy. The installer was forced to rip all this out and do it properly.